﻿ Stroke by PICC: Which patient is at risk? Stroke by PICC: Which patient is at risk? Patient 1, a 65-year-old man with a right upper-extremity, peripherally-inserted central venous catheter (PICC) in place, was transferred from an outside hospital after developing acute neurological symptoms. 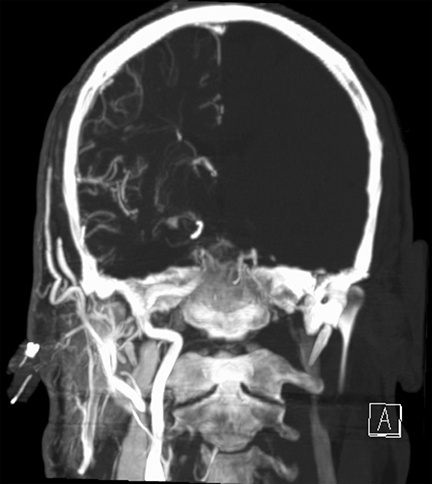 These symptoms were evaluated with computed tomography (CT) angiography of the head after contrast was injected through the PICC. 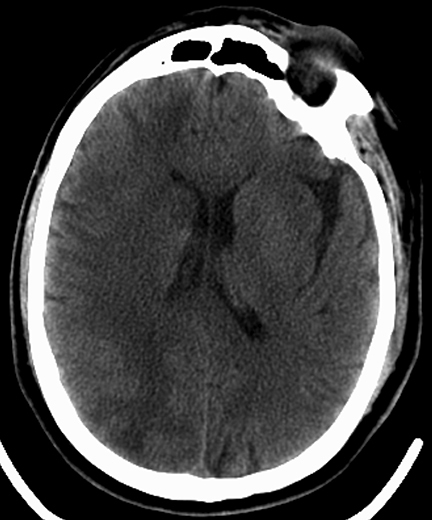 Patient 2, a 46-year-old man, was hospitalized after acute right hemiparesis. One day later, a left upper-extremity PICC line was inserted at bedside by the PICC nurse. A CT angiogram of Patient 1 demonstrated opacification of the right cerebral hemisphere with no enhancement of the contralateral brain and foci of gas within the parenchyma (Figure 1). 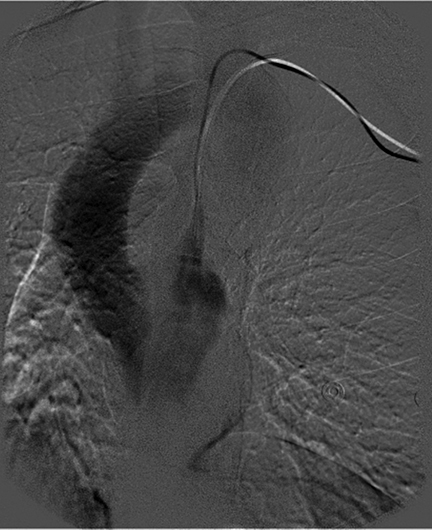 The position of the PICC was called into question, given the unique imaging features. Chest imaging revealed the distal tip of the PICC overlying the right upper mediastinum (Figure 1). The tip of the PICC was within the right subclavian artery. The PICC was removed immediately. 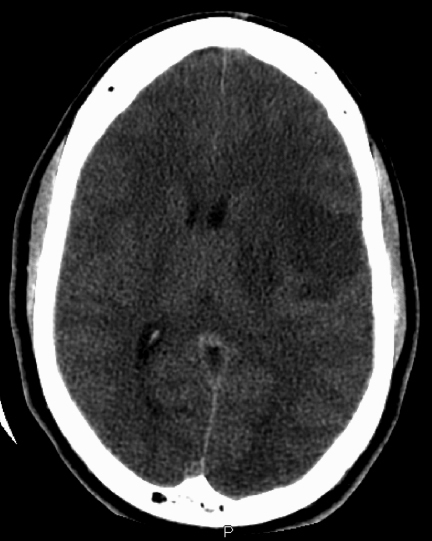 Head CT several days later demonstrated ischemic changes in the right cerebral hemisphere (Figure 1). 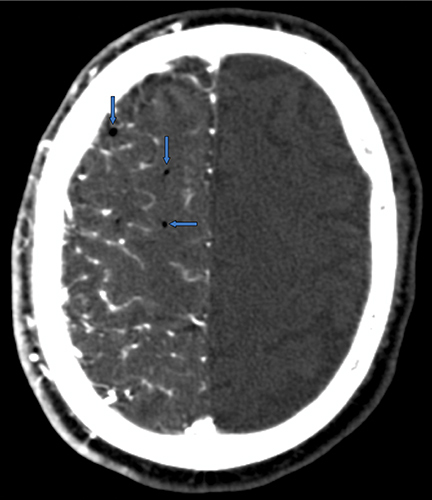 An unenhanced head CT scan of Patient 2 demonstrated ischemic changes in the posterior-left frontal lobe (Figure 2). 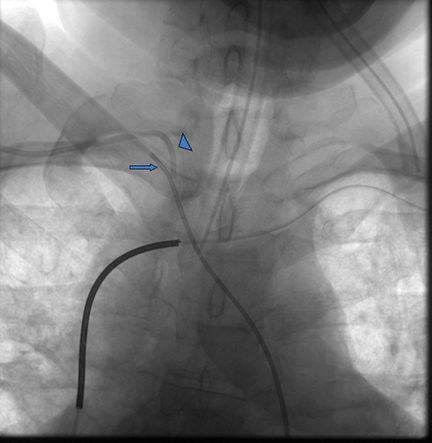 A chest x-ray performed after PICC placement revealed the distal catheter course was in the upper left mediastinum, either within a left SVC or aorta (Figure 2). The patient was brought to interventional radiology for possible PICC repositioning. A digital subtraction angiogram (DSA) revealed a persistent left SVC that emptied directly into the systemic circulation via the left atrium (Figure 2). DSA injection through a right internal-jugular pigtail catheter in the IVC demonstrated emptying of contrast into the right atrium and no right-to-left shunting. Because the right internal-jugular vein drained into the right heart circulation, a central venous catheter was placed through this vein. The left PICC, which drained into the left heart circulation, was removed. Patient 1 was diagnosed with a right hemispheric stroke following intracranial injections through a PICC in the right subclavian artery. Patient 2 was diagnosed with a left hemispheric stroke that preceded placement of a PICC in a persistent left SVC that drained into the left atrium. Thus far, case reports in the medical literature have described arterial PICC placement with the catheter tip central to the carotid or vertebral arteries. 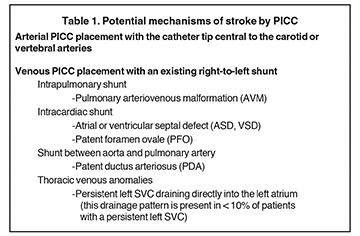 The potential mechanisms of stroke due to PICC are conceivably more extensive (Table 1). The mechanism of stroke from an upper-extremity PICC, as seen in Patient No.1, presumably involves an embolism of clot, air bubble or drug with high viscosity or sclerosing qualities being introduced directly into the carotid or vertebral arteries. Ultimately, these materials occlude small intracranial arteries that result in stroke. In Patient No. 2, the PICC had been inserted after the right hemiparesis, did not cause new neurologic symptoms, and was not the cause of the stroke. Yet, a PICC in a persistent left SVC that drains into the left atrium could easily have caused neurologic damage if the PICC had been used. Such a patient should not have an IV catheter in the left arm or neck. Misplacement of an upper-extremity PICC into the arterial system occurs rarely because of periprocedural imaging. During PICC placement, entry of the micropuncture needle into the brachial artery is avoided through ultrasound guidance. However, the distal tip of the micropuncture needle may be incompletely visualized by the operator, which allows for inadvertent arterial entry. 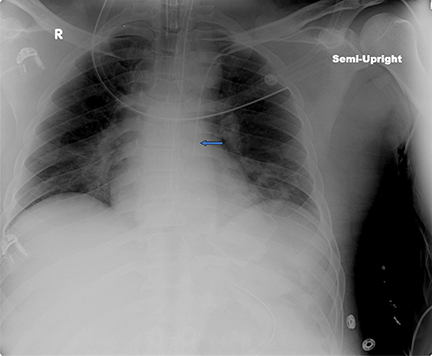 A chest x-ray obtained after the procedure should raise concerns if the catheter tip does not overlie the expected location of the cavoatrial junction. Yet, plain film of the chest has substantial limitations in localizing a catheter; cross-sectional imaging and angiography are more likely to provide conclusive localization of a PICC. More widespread use of bedside ultrasound and electrocardiographic-assisted localization for PICC insertion will reduce the frequency of chest x-ray confirmation. It is unclear whether these new verification modalities can always detect intraarterial PICC placement. Clinicians often rely on obtaining transducer measurements or arterial blood gas determination when there is suspected inadvertent placement of central venous catheters into an artery. PICCs are pervasive access devices used in patients with complicated illnesses. When a hospitalized patient develops acute neurologic symptoms, the existing upper-extremity PICC is typically not suspected as the etiology. Neurologic complications, including stroke, may result from upper-extremity PICC placement in either the arterial or venous system. The presence of acute neurologic findings in a patient with a PICC should raise the question of whether the catheter is in the arterial system or in the venous system with a right-to-left shunt. Waybill PN, Cantwell CP. Chapter 117: Peripherally inserted central catheters and nontunneled central venous catheters. In: Mauro MA, ed. Image-Guided Interventions. Philadelphia, Pa.: Saunders, 2008;1225-1235. 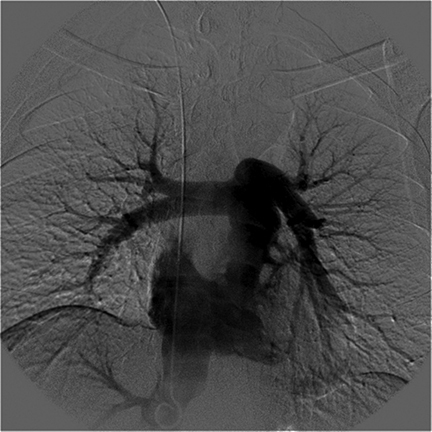 Siegel RL, Nosher JL, Bodner L. Routine peripherally inserted central catheter placement resulting in delayed intravascular foreign body. J Vasc Interv Radiol.2004;15:1167-1169. Park KB, Choo WS, Do YS, et al. Peripherally inserted central catheter placement in patients with unsuspected central venous obstruction. J Vasc Interv Radiol. 2008;19:552-556. Parikh S, Narayanan V. Misplaced centrally inserted central catheter: an unusual cause of stroke. Pediatr Neurol. 2004;30:210-212. Garg N, Noheria A, McPhail IR, et al. Embolic strokes after peripherally inserted central catheter placement. Ann Vasc Surg. 2010;24:1133.e1-1133.e4. Stroke by PICC: Which patient is at risk?. Appl Radiol. Prepared by Dr. Obert, Dr. Wolujewicz, Dr. Vu, and Dr. Ristagno while at the Department of Radiology, University of Cincinnati Medical Center, Cincinnati, OH.